This policy reflects our duties under the Data Protection Act to keep any information you give us secure, and to use it only with your permission. If you have any concerns, please email us. If you are not satisfied with our response to your concern you may wish to contact the Information Commissioner’s Office. We collect only that personal information that you choose to provide via this website or by email. Like any website when you request a page we also automatically receive and record information sent by your computer, including your IP address and which browser you are using. When you access this site your login details may be stored on a ‘cookie’. This is a tiny element of data that our site can send to your browser, which may then be stored on your hard drive. This small amount of information does NOT contain any private information stored on your computer.For more information about cookies, please see www.allaboutcookies.org. If you set your web browser to disable cookies altogether, you will not be able to access the full functionality of the site. We will only use the personal information you give us to send you communications about the campaign. We may however produce and publish statistics from the survey for use by us or third parties in support of the campaign. 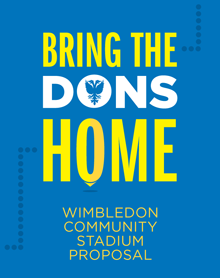 Unless it is clearly stated otherwise, we will never pass any personal information you give us on to a third party (including AFC Wimbledon or the Dons Trust) unless we have your permission, or under special circumstances, such as when the law requires it. We make every effort to protect any information you give us. However, no data transmission over the Internet can be guaranteed to be 100 percent secure. How can I access, correct or delete my data? At your request we will give you all details of personal information we hold, once your identity has been satisfied. Incorrect information will be deleted or amended promptly. We will give you confirmation of corrections and deletions. We will only send you emails if you have signed up to the campaign or submitted a message as part of the consultation process by completing a form on this site. We do not send out spam. Any email we do send will clearly state it is from us and give you the option to opt-out from further mailings. If you do not wish to receive messages from us, please contact us asking that your contact information be deleted from our databases. No information should be submitted here by children under the age of 13 without prior parental consent. The collection and use of personal information on this site is in accordance with the Data Protection Act of 1998 ( UK), and the guidelines of the Direct Marketing Association (UK). We will never transfer information outside of the UK.